The Libyan national football team is going to play Sunday evening against South Africa in Tunisia’s Sfax as part of the final round of Group 5 of the AFCON 2019 qualifiers. The Libyan team needs a win to qualify while Bafana Bafana can qualify with any score but loss. The match is to kick off at 20.00 local time in Libya. Meanwhile, the Libyan Interior Ministry of the Government of National Accord has sent 3000 Libyan fans to support the national football team in its final Group 5 match in Tunisia against South Africa for the ticket to Egypt-hosted AFCON 2019. 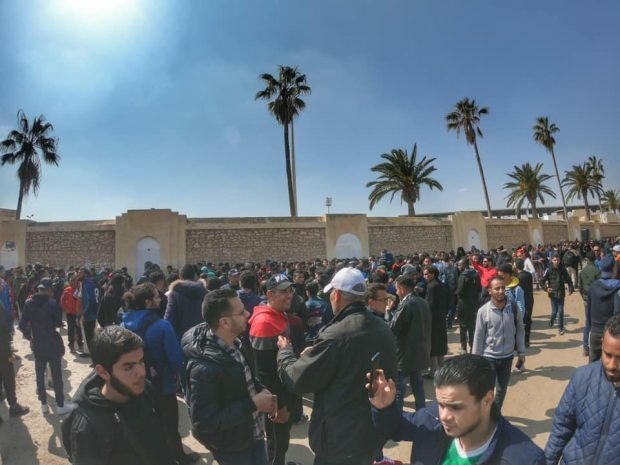 Fans started entering the Taïeb Mhiri stadium in Sfax, Tunisia.